These old-style square cut nails are made in the USA from solid steel and are the perfect finishing touch for face nailing floors, or for nailing fences, siding, paneling or cabinets. Ideal for authentic restoration work. Rooted in age-old tradition, our wide array of period restoration nails are cut much the same way they were 150 years ago. The result? Outstanding durability and holding power, designed to last a lifetime. These solid-steel standard nails are popular for general purposes work, wood fences, or for applying wood siding over sheathing. Once you've experienced the quality and performance of our vintage reproductions, they'll surely become your preferred choice for a variety of applications. Made in the USA. Rooted in age-old tradition, our wide array of period restoration nails are cut much the same way they were 150 years ago. The result? Outstanding durability and holding power, designed to last a lifetime. These solid-steel standard nails are popular for general purposes work, wood fences, or for applying wood siding over sheathing. 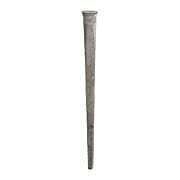 Ideal for exterior applications, they are hot dipped in zinc to prevent rust. Once you've experienced the quality and performance of our vintage reproductions, they'll surely become your preferred choice for a variety of applications. Made in the USA. Rooted in age-old tradition, our period restoration Square-Cut Boat Nails are cut much the same way they were 150 years ago. The result? Outstanding durability and holding power, designed to last a lifetime. These solid-steel nails are ideal for floor installation. Once you've experienced the quality and performance of our vintage reproductions, they'll surely become your preferred choice for a variety of applications. Made in the USA. Rooted in age-old tradition, our period restoration Black Oxide Square-Cut Common Nails are cut much the same way they were 150 years ago. The result? Outstanding durability and holding power, designed to last a lifetime. 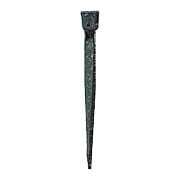 Emulating hand-forged nails of the late 1700's, these solid-steel versions feature a black-oxide coating, ideal for rough sawn siding, face-nailing flooring, paneling, countertops, and cabinet work. Once you've experienced the quality and performance of our vintage reproductions, they'll surely become your preferred choice for a variety of applications. Made in the USA. Rooted in age-old tradition, our period restoration Hot Dip Galvanized Square-Cut Rosehead Nails are cut much the same way they were 150 years ago. The result? Outstanding durability and holding power, designed to last a lifetime. These solid-steel nails are used for nailing furring strips and other materials to cinder block, mortar joints, new concrete, and brick walls. Ideal for exterior applications, they are hot dipped in zinc to prevent rust. Once you've experienced the quality and performance of our vintage reproductions, they'll surely become your preferred choice for a variety of applications. Made in the USA. Rooted in age-old tradition, our period restoration Black Oxide Square-Cut Fire Door Nails are cut much the same way they were 150 years ago. The result? Outstanding durability and holding power, designed to last a lifetime. Made of solid steel, they are useful for fabricating laminated fire doors, clapboard siding, face-nailing, and wide board flooring. Featuring a black-oxide coating, they emulate hand-forged nails of the late 1700's. Once you've experienced the quality and performance of our vintage reproductions, they'll surely become your preferred choice for a variety of applications. Made in the USA. Rooted in age-old tradition, our period restoration Black Oxide Square-Cut Fire Door Clinch Nails are cut much the same way they were 150 years ago. The result? Outstanding durability and holding power, designed to last a lifetime. Made of solid steel, they are useful for fabricating laminated fire doors, clapboard siding, face-nailing, and wide board flooring. Ideal for exterior applications, they are hot dipped in zinc to prevent rust. Once you've experienced the quality and performance of our vintage reproductions, they'll surely become your preferred choice for a variety of applications. Made in the USA. Rooted in age-old tradition, our period restoration Hot Galvanized Square-Cut Flooring Nails are cut much the same way they were 150 years ago. The result? Outstanding durability and holding power, designed to last a lifetime. These solid-steel nails are recommended for laying tongue-and-groove hardwood flooring (not recommended for face-nailing softwood flooring as the head is too small). Ideal for exterior applications, they are hot dipped in zinc to prevent rust. Once you've experienced the quality and performance of our vintage reproductions, they'll surely become your preferred choice for a variety of applications. Made in the USA. Rooted in age-old tradition, our period restoration Square-Cut Sheathing Nails are cut much the same way they were 150 years ago. The result? Outstanding durability and holding power, designed to last a lifetime. 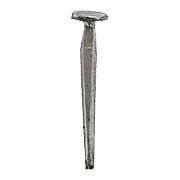 These solid-steel nails are ideal for attaching sheathing to wood studs and for face-nailing thick board flooring. Once you've experienced the quality and performance of our vintage reproductions, they'll surely become your preferred choice for a variety of applications. Made in the USA. Rooted in age-old tradition, our wide array of period restoration nails are cut much the same way they were 150 years ago. The result? Outstanding durability and holding power, designed to last a lifetime. 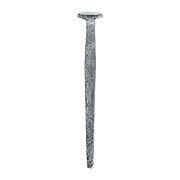 These solid-steel, button-head nails are ideal for nailing furring strips and other materials to cinder block, mortar joints, new concrete, and brick walls. 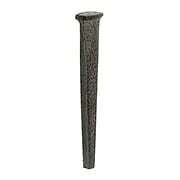 Featuring a black-oxide coating, they emulate hand-forged nails of the late 1700's. Once you've experienced the quality and performance of our vintage reproductions, they'll surely become your preferred choice for a variety of applications. Made in the USA. Rooted in age-old tradition, our period restoration Square-Cut Hardened Masonry Nails are cut much the same way they were 150 years ago. The result? Outstanding durability and holding power, designed to last a lifetime. These solid-steel nails are ideal for nailing furring strips and other materials to cinder block, mortar joints, new concrete, and brick walls. Once you've experienced the quality and performance of our vintage reproductions, they'll surely become your preferred choice for a variety of applications. Made in the USA. Rooted in age-old tradition, our period restoration Square-Cut Hinge Nails are cut much the same way they were 150 years ago. The result? Outstanding durability and holding power, designed to last a lifetime. These solid-steel nails are made from a slightly lighter gauge steel, ideal for fastening antique hinges or face-nailing floors. They can also be used for furniture repair, cabinet work, batten doors, and countertops. Once you've experienced the quality and performance of our vintage reproductions, they'll surely become your preferred choice for a variety of applications. Made in the USA. Rooted in age-old tradition, our period restoration Square-Cut Shingle Nails are cut much the same way they were 150 years ago. The result? Outstanding durability and holding power, designed to last a lifetime. 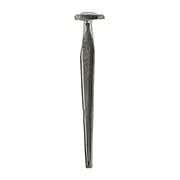 These solid-steel shingle nails have blunt points to reduce wood splints and a cut nail shank that holds tight. Once you've experienced the quality and performance of our vintage reproductions, they'll surely become your preferred choice for a variety of applications. Made in the USA.